Intersectional Suffrage: A focus on the women that didn’t get the vote in 1918. 2018 marks the centenary of the first women in the UK being allowed to vote. The 1918 Representation of the People Act allowed women over the age of 30 to vote provided they were university graduates, had certain property rights, or were married to men who had certain property rights. Ten years later, the 1928 Representation of the People Act provided electoral equality, allowing all women over the age of 21 to vote, regardless of property rights. 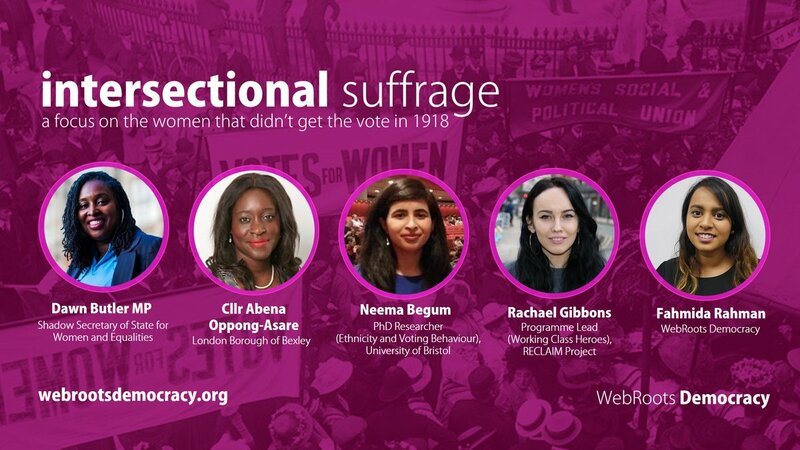 Join us on the 20th of February as we learn more about the women who were denied the vote in 1918 and to explore current voting behaviour and political representation across class, gender, and ethnic divides in 2018. Stay updated and follow WebRoots Democracy on Facebook, Twitter, and Instagram.